Notice: This is an re-edited, updated and enlarged version of an earlier posting at this blog! L'Archéologie de la Grande Guerre is a must-have-book for anyone with a slightest interest in the remains of the First World War, and for all students of historical archaeology in general. You do not even need to read it to get the idea of the extreme materiality of the this particular historical event: The numerous colour photographs from several archaeological excavations during the previous 10-20 years or so make it all very clear (Zac Actiparc, Point du Jour, Saint-Laurent-Blangy, Flesquières, Dourges, Huiron, Monchy-le-Preux, Braine, Gavrelle, Estrées-Deniécourt, Wancourt, Thélus, Roclincourt etc.). 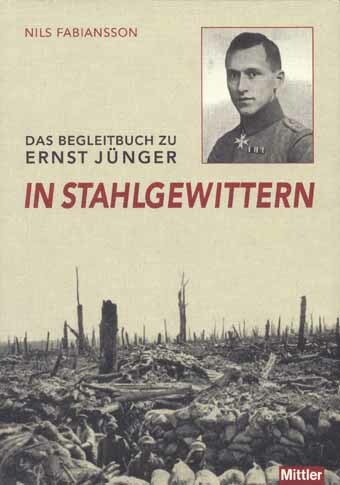 This book illustrates very explicitly what is hidden beneath the fields along the Western Front, what was covered by mud, dirt and earth during and after the war. Among the most illustrative are in my view a couple of otherwise rather unspectacular on-site photographs, for example of a cross-section of an excavated trench, showing the amount of war debris in backfilled trenches after the war, i.e. what to expect everywhere along the front; and a photograph of what was probably the most common type of massgrave during the war, bodies in a filled-in length of trench. Était-il possible que l’archéologie escamote les traces d’un passé redécouvert sous prétexte qu’il était trop récent ? Certes les tranchées et les tirs d’obus ont parfois en partie mis à mal des sites bien plus anciens, mais l’exploration archéologique des vestiges de la Grande Guerre livre des indices passionnants sur ce que fut la sombre vie des poilus et qui n’est pas raconté dans les livres d’histoire. Trois archéologues responsables de fouilles livrent les fruits de leurs observations et recherches sur les terrains du Nord et de la Picardie , de l’artisanat à base de douilles d’obus aux rites funéraires pratiqués sur les champs de bataille. Le souci de donner une sépulture aux corps retrouvés et la mise au jour de cette face cachée, humaine et quotidienne, de la guerre retisse un lien avec un passé plus si récent, qui commençait à s’estomper de nos mémoires. L'Archéologie de la Grande Guerre is the most recent of four books covering the progress and current situation of professional archaeology of the Western Front remains (see the other three below). The authors ("the three archaeologists") are: Yves Desfossés, Conservateur régional de l’Archéologie de Champagne-Ardenne, Ministère de la Culture; Alain Jacques, archéologue municipal de la ville d’Arras; Gilles Prilaux, ingénieur à l’INRAP., Nord-Picardie. These are the pioneers of French professional rescue (preventive/salvage) archaeology, the first (besides Frédéric Adam, mentioned below, and a few more) who regarded the material remains of the Great War as archaeological remains during their excavations and surveys along planned motorways, new TGV-railroads and other constructions sites. They published 10 years ago the now almost classic texts in this context "Préserver les Traces", in 14-18: aujourd'hui. Today. Heute, no 2: "L'Archéologie et la Grande Guerre" (Noêsis Paris, 1998), pp. 36-51, and "Premières recherches sur la grande guerre dans le Nord-Pas-de-Calais", Archéologia, no. 367 (2000), pp. 32-38. Although the text in this book has almost no bibliographical references, the British authors, Andrew Robertshaw and David Kenyon, have written a splendid overview of the progress and current situation of Western Front archaeology, with focus on the archaeological excavations and surveys made by their group the "Trench Team" or "No-Man's-Land". 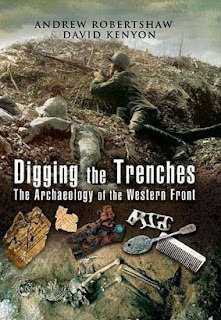 Digging the Trenches: The Archaeology of the Western Front is a book about the First World War 1914-1918, or rather, the Western Front 1914-1918, from the perspective of its material remains. Thus it could be read as a presentation of the war, although the perspective is slightly diffrent from other WW1-books. This is also the only of these four books were the Western Front archaeology is critically discussed in some depth. That is important! They discuss the crucial questions about why archaeologists should be doing this. They say that "a wealth of new knowledge about the war can be gained by digging" and that "the whole pursuit of Great War archaeology has as its goal an effort to reach past the simple memorialisation of the war and try to present the experience of it". They mean that it make us come "closer to the real character of the conflict" (pp. 16-17, 34). Also interesting is that they present the nature of battlefield archaeology at the Western Front; i.e. preservation, taphonomy, deposition, stratigraphy and safety. 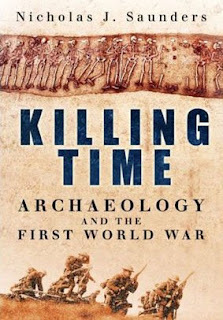 Killing Time by the British anthropologist Nicholas J. Saunders (Lecturer in Material Culture, and British Academy Senior Research Fellow in the Department of Anthropology, University College London) is the first monograph* ever to cover the progress of professional historical archaeology along the former Western Front. Saunders' approach is the anthropologist's rather than the historian's or the archaeologist's, and the material remains of the First World War, preserved both archaeologically and as antiques, are regarded as objects representing a material culture of the time and place. Although Saunders' approach as well as the book's reference system is scholarly, the book is a great overview (including bibliography) of the professional archaeology of the First World War not only for scholars and students. These four books complement each other. To get an overview of the development and progress of the archaeology of Great War you need Killing Time, to get a picture of it, you need L'Archéologie de la Grande Guerre. 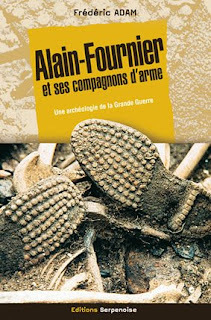 To get deeper in to the archaeological process of this particular archaeology you need Alain-Fournier et ses compagnons d'arme and Digging the Trenches. Thus now finally most of the professional archaeology carried out in France the last 20 years is published! What we are waiting for is now a major publication covering the Belgian work carried out by their Belgian collegaues in A.W.A. during the archaeological survey of the A19 Project back in 2003 - although there are a few smaller publications and reports covering this project. * For an early anthology about the progress of Western Front archaeology, see for example Nicholas J. Saunders' Matters of Conflict: Material Culture, Memory and the First World War from 2004.